The TC646B is a new version of the existing TC646 fan speed controller. This device is a switch mode fan speed controller, which incorporates a new fan auto restart function. Temperature proportional speed control is accomplished using pulse width modulation. A thermistor (or other voltage output temperature sensor) connected to the VIN input supplies the required control voltage of 1.20V to 2.60V (typical) for 0% to 100% PWM duty cycle. The auto-shutdown speed is set by a simple resistor divider on the VAS input. An integrated Start-Up Timer ensures reliable fan motor start-up at turn-on, coming out of shutdown mode, auto-shutdown mode, or following a transient fault. A logic low applied to VIN, pin 1, causes fan shutdown. 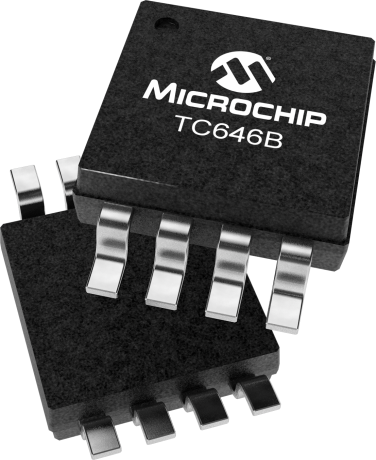 The TC646B also features Microchip Technology's proprietary FanSense™ technology for increasing system reliability. In normal fan operation, a pulse train is present at SENSE, pin 5. A missing-pulse detector monitors this pin during fan operation. A stalled, open, or unconnected fan causes the TC646B device to turn the VOUT output on full (100% duty cycle). If the fan fault persists (a fan current pulse is not detected within a 32/F period), the FAULT output goes low. Even with the FAULT output low, the VOUT output is on full during the fan fault condition in order to try and restart the fan. The FAULT signal is also asserted if the PWM reaches 100% duty cycle, indicating that maximum cooling capability has been reached and a possible thermal runaway condition exists.